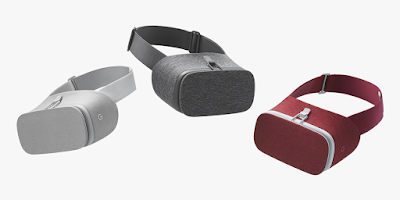 Google has launched Daydream View VR headset in India priced at Rs 6499 available via Flipkart, VR headset is compatible with Pixel and Pixel XL smartphones. The Daydream platform was announced in May at I/O conference. The Daydream View VR headset is powered by Android 7.0 Nougat. It is made out of soft micro fiber and Google says it had worked with clothing designers for the design. It is 30% lighter than similar devices and is designed to fit over eyeglasses. The VR headset is soft and lightweight. Google has already partnered with Samsung, HTC, LG, Xiaomi, Huawei, ZTE, Asus, and Alcatel for readying smartphones with Daydream. In addition, the company will team up with over 50 partners for apps and games later this year. Enjoy the best of Google. Google apps into VR. With YouTube, you can watch the entire library of videos on a virtual big screen and experience immersive videos from creators like Buzzfeed, PrankvsPrank, Meredith Foster, CollegeHumor, Tastemade, UnboxTherapy, and VSauce2. Use Google Street View to see curated tours of more than 100 of the world’s most amazing places like the Pyramids and the Taj Mahal, or just search to explore everywhere else. Google Play Movies makes tens of thousands of movies and TV episodes available in your own virtual theater. And Google Photos displays your 360° captures in a whole new way. It comes in three colors – slate, snow and crimson.